... 1951 (60 years ago today), Paula von Preradović died. She'd been born 63 years earlier in Vienna, Austria, then moved to Pula, a city on the southern tip of the Istrian Peninsula in what was then the Austro-Hungarian Empire but today is Croatia. Later she lived in Copenhagen and again in Vienna. 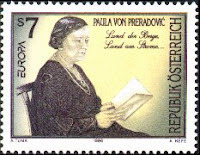 (credit for image of Austrian postage stamp in her honor) A writer and narrator, Preradović is the author of the lyrics for Land der Berge, Land der Ströme (Land of Mountains, Land on the River), adopted in 1947 as Austria's national anthem.